The Agroforestry Research Trust is an educational and research organisation, founded in 1992 as a registered charity, to educate and conduct research into all aspects of agroforestry. Various academic and practical research projects have been undertaken since its formation, and results of research published by the Trust in a number of publications and in its own quarterly journal, Agroforestry News. Courses and tours are also run on aspects of our work. The Trust Director, Martin Crawford, has planned and carried out all research to date and is also involved in the other aspects of the Trust’s work. He has spent over 30 years in organic agriculture and horticulture, including working for the Yarner Trust in North Devon (teaching small-scale organic agriculture); growing food for a small hotel on the Isle of Iona; restoring the walled gardens of a manor house in mid-Devon; and running his own organic market garden and tree nursery in South Devon. Funding for the work of the A.R.T. comes from several sources. Self-generated income comes from sales of plants, seeds and publications, and also from course fees. In addition, some income comes from grant-making Trusts and in donations from individuals. This is the first of two projects taking place on the Dartington Estate in South Devon. 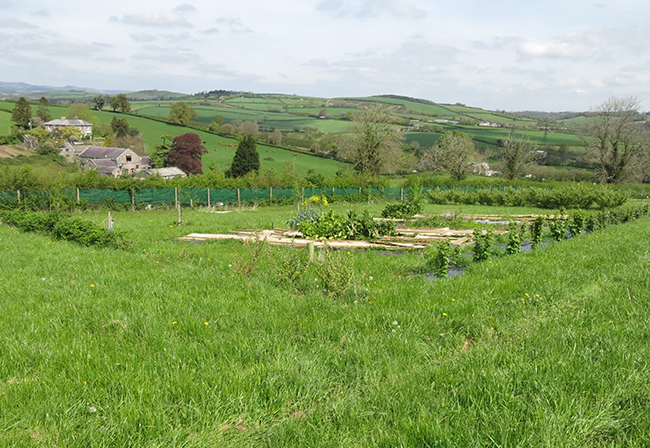 A 2.1 acre field has been converted since 1994 into a demonstration forest garden comprising many different levels of trees, shrubs and ground covers, all coexisting and producing useful products such as fruits, nuts, medicinal products etc. The forest garden is self-sustaining, containing a very diverse number of species and thus very resilient to pests, diseases and the vagaries of the climate. It provides a wide variety of fruits, nuts, edible leaves, medicinal plants, poles, fibres for tying etc. 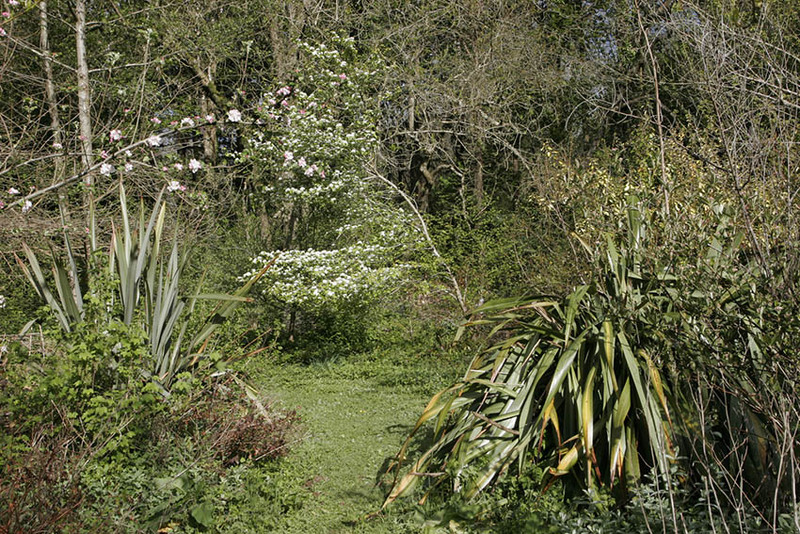 It is self-fertilising by the use of specific plants which supply nutrients: nitrogen-fixing trees and shrubs (particularly Alders and Elaeagnus) which can utilise nitrogen directly from the air and make it available to other plants; and dynamic accumulators (particularly coltsfoot, comfrey, sorrel) – deep-rooting plants which tap phosphate and potash sources deep in the subsoil, raise them into the topsoil layer and make them available to other plants. Around 140 different species of tree and shrub crops has been used to form the ‘canopy’ layer of tallest trees and shrubs. These range from common species like apples, pears and plums, to less common ones like azaroles, chinkapins, cornelian cherries, highbush cranberries, honey locusts, Japanese pepper trees, medlars, mulberries, persimmons, quinces, strawberry trees, and sweet chestnuts. An area of basketry willows has been planted in a wet area of the site. Shrubs of varying sizes occupy much of the space beneath trees, including the more common bush fruits (currants and berries) and others such as barberries, elaeagnus, Japanese bitter oranges, Oregon grapes, plum yews, and serviceberries. Many of the understorey shrubs are be nitrogen-fixers. In the latter years of planting, the grass ground cover has gradually been replaced with other ground cover species of use. Main species used for ground cover will include: Bamboos, especially dwarf species; Carpeting species of Rubus (blackberry family), Gaultheria; Herbs; Deep rooting perennials such as Comfrey. Che (Cudrania tricuspidata) seedling plot. Date plum (Diospyros lotus) seedling plot. American persimmon (Diospyros virginiana) seedling and cultivar trial plot. Holm oak (Quercus ilex) seedling plot from sweet-fruited parents, plus ballota and emory oaks (Q.ilex ballota & Q.emoryi). Trials of unusual fruits now include American pawpaw, and service trees. Chestnut variety trials. These are trials of mainly French chestnut cultivars, with 18 selections now planted. Walnut variety trials. Trials of French, German and N.American walnut cultivars, with 20 selections now planted. Hazelnut breeding experiment, aiming to find good selections from N.American hybrid seedlings. Unusual nut trials: including butternuts, heartnuts, monkey puzzle, ginkgo, nut pines, sweet-fruited oaks including local holm oaks and N.American hybrids. Sorbus species evaluation trials, including a planting of the rare Devon species, Sorbus devoniensis with edible fruits. Trials of Eastern European black locust cultivars. These 5 selections, obtained from the Hungarian Forest Research Institute, may make black locust silviculture economic in the UK. Disease-resistant cultivar trial of 25 pear cultivars and 25 plum cultivars. This 10.7 acre site near Totnes was acquired in 2011. Our plant nursery has moved here. Initial work in 2011 consisted of groundworks and erection of two poyltunnels and agricultural shed. 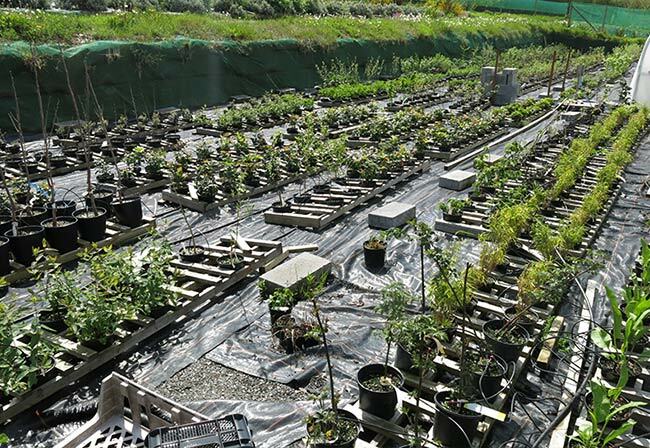 A second, 2000 sq metre (half acre) forest garden was started in 2012/13, along with other tree-based trials. In 2016/17 a new glasshouse was erected which is becoming a forest garden greenhouse – see here for more details.